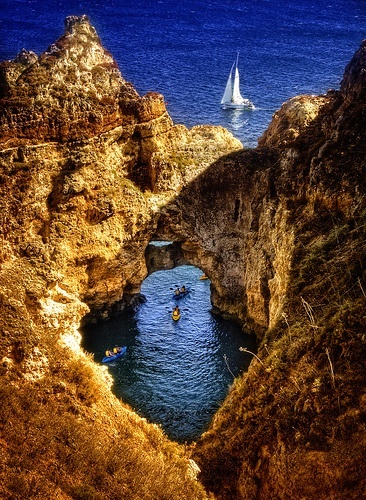 Lagos is a municipality at the mouth of Bensafrim River and along the Atlantic Ocean, in the Barlavento region of the Algarve, in southern Portugal. The main town of Lagos (which includes only the parishes of Santa Maria and São Sebastião) has a population of approximately 22,000 residents, while the municipality supports a resident population of 31,048 inhabitants. Typically, these numbers increase during the summer months, with the influx of visiting tourists and seasonal residents. While the majority of the population lives along the coast and works in tourism and services, the inland region is sparsely inhabited, with the majority of the people working in agriculture and forestry.